Chapter 4 Page 15 is up. Snow-by-Night isn’t being nearly as docile and obedient as Jassart hoped. Manitou are not tame spirits. 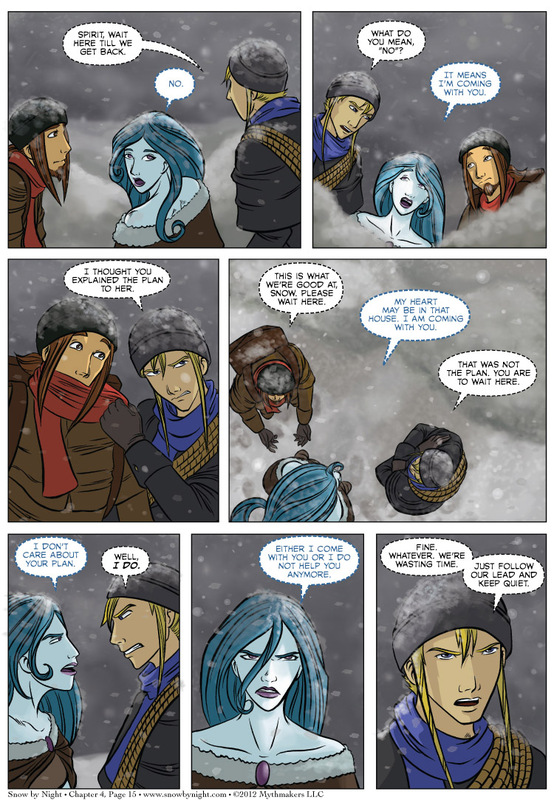 To see one of the challenges that the crew will be facing, vote for Snow by Night on Top Web Comics. Summer convention season is almost upon us. Our first convention this year is Heroescon down in Charlotte on June 22-24. Come by and see us if you’re attending. You mean mad at somebody other than me, right…? Her heart MAY be in that house? Well, I guess she’s not going to be too upset if it turns out that it’s not there after all. Well, they know it’s not there, so hedging a bit up front is smart; they can pull this trick a few more times. Plus, can you ever be sure *enough* that the supernatural being you’re about to cheat can’t detect lies? Especially when she’s close to no less of a power than Winter?